If I have learned anything from cooking in Italy and cooking with Italians it is this……do not smother pasta with sauce…it needs to ‘sing with’ whatever you serve it with not be upsatged by it. Now, as a youngster my heart would sink ever time a big bowl of spaghetti landed in front of me with little more than a spoonful of meat sauce…I just didn’t get it. But year after year travelling and eating in Italy slowly changed this and now I think I’ve nailed it and this dish and a few others are cut straight from the ‘pasta is king’ block. And if you’re like me and you’re hooked on pasta then I hope you’ve made you own home-made pasta at some stage – if not you really gotta give it a swing, it’ll change you life! STEP1: So this is a 15 minute monster mid-week marvel (lots of M’s) – this is fast and edgy cooking. Get a pot of water well salted up to ‘angry’ boil…then dump in the pasta. 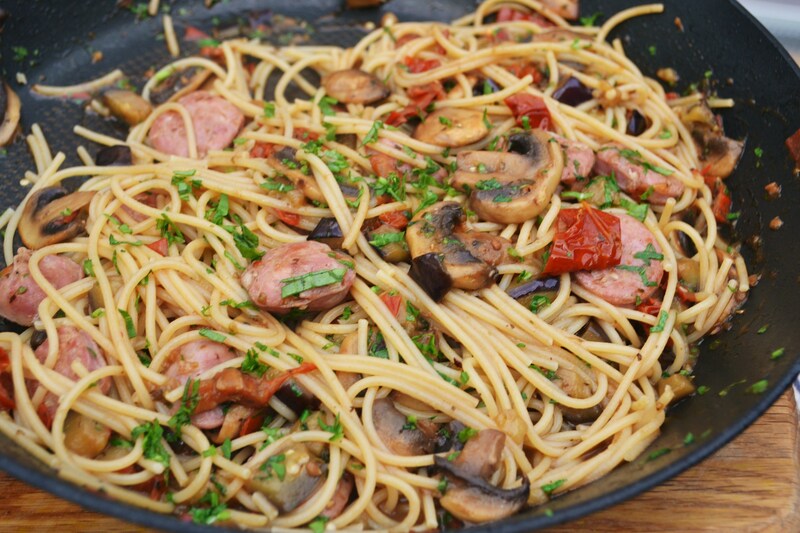 STEP2: Next get the ragu going – slice or chunk the sausage and fry in a little olive oil until just starting to colour then dump in the tomatoes, aubergine, mushroom and anchovy and fry everything together – check the seasoning. STEP4: To incorporate pasta with ragu simply toss in the pan…it should be ‘slurpy’ as you do this so it will give you a good idea of how much starchy pasta water you should have. Next Post ‘The Greek Grill’ – lamb, fennel, peppers, chickpeas… oh my!